Our 5 year anniversary falls on the 28th of June this year, if we consider our birth date to be the date our public beta went live. Time to celebrate this Travel.SE style - with a competition! The other way to do this would be to define a rota, so that each participant posts a bounty on their assigned days. The result here would be to have the community create a total of 30 bounties posted throughout the month. This could be our plan B in case we don't get enough participants for proposal 1. This option costs the participants about 150 rep (3 bounties * 50). Then we go and advertise this in other SE websites, asking people to come and answer questions here, luring them in with prizes and rep. The objective being to reduce our unanswered rate whilst gathering new potential contributors. Ideally we'd need a minimum of 10 participants to make this interesting. That would amount to a minimum of 30 bounties per week, if all remain in the competition. The objective of this post is to discuss the idea with the community, to see if we like it and improve the concept. I have posted the two proposals as answers. Please upvote the one you like best. If you have a third (or fourth or twentieth) proposal, by all means post it as an answer. Not to worry. The final two weeks of May 2016 is for the "Great Flood of Bounty Worthy Questions", where we flood the site with incredibly wonderful questions that can be bountied. The winner of that mini-competition gets street-cred for creativity. Not to worry. Any question will do. Answered, unanswered, old, new, whatever... As long as it's a real question that is half-way decent, you can put a bounty on it to bring it more attention. Remember, the big objective here is to have a bounty bonanza that attracts lots of new people from other SO sites who see what's on and think, "...hey! I can pick up some rep over on Travel by collecting a few bounties...". Maybe they will, maybe they won't, but perhaps a few will go on to become great TSE companions. Don't have rep to spare for bounties? Not to worry. If you want to participate but are struggling with reputation, see "finding a bounty worthy question" above. You can jump in and help by saving up some incredibly fascinating questions. Do you like to prospect for investment properties while travelling for leisure? Do you like to go ice-fishing in the Hudson Bay? Are you looking for a place to go bead-begging when the Mardi Gras is over? Did you ever think about wind-surfing down the Danube? Why is there a golf club next to Nuuk airport? Which parts of the underground city in Verona are open to the public? Put your thinking caps on! 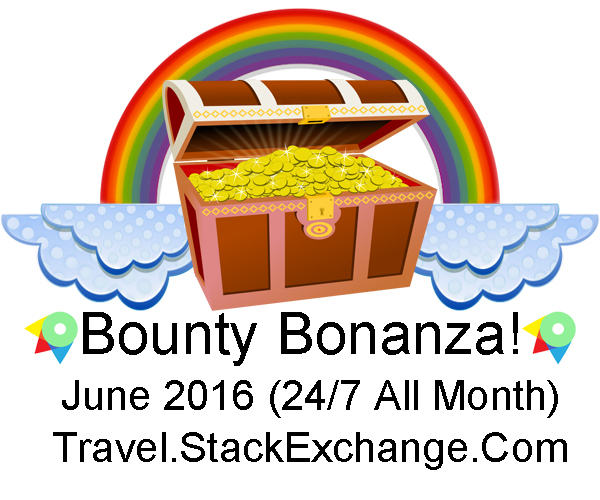 Participants must have three bounties on offer throughout the duration of the bonanza. Mark created a chat event for the Bonanza. Let's make sure that the interested users register there. "Gold" giveaway. Gold-level participants commit to having three open bounties throughout the duration. "Silver" giveaway. Silver-level participants commit to having two open bounties throughout the duration. "Bronze" giveaway. Bronze-level participants commit to having one open bounty throughout the duration. Participants define a rota so that each participant posts a bounty on their assigned days. Upvote this if you prefer this proposal. Not the answer you're looking for? Browse other questions tagged discussion status-completed fun competitions bounties . Can bounties be refunded by mods now? Down memory lane: Please nominate the best answers of 2011?